S’Zen Mixology Lounge offers exquisite and artfully crafted cocktails with natural ingredients, hand-crafted ice, and a touch of magic from mixologist, Albert Trummer of Sanatorium. Enjoy the laid-back yet sophisticated atmosphere on the 2nd floor of Hotel on Rivington, named as the “Sexiest Hotel in NYC” by Time Out NY. 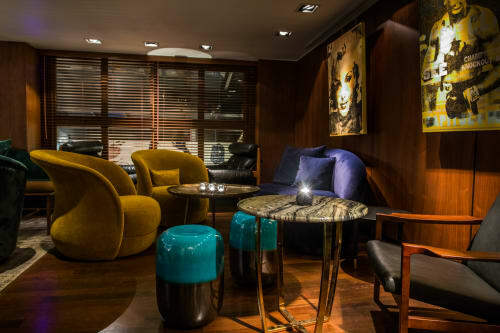 The lounge doubles as a rotating art gallery featuring exciting work by artists such as Domingo Zapata, Matheus Goulart, and Peter Mars, curated by Art on Rivington. You and your guests can take the mural-tagged spiral staircase Upstairs which overlooks the Lower East Side. The sophisticated yet comfortable atmosphere and rotating art program create a perfect setting for a cocktail party, private event or brand launch.